In between visits, what a difference one year makes, and how things can also remain unchanged in the same interval of time. The area around Friedrichstrasse train station is lively with pedestrians, commuters, tourists scurrying in and out of shops, in and out of trams, and in and out of the train station. There are an S-Bahn and a U-Bahn station here. 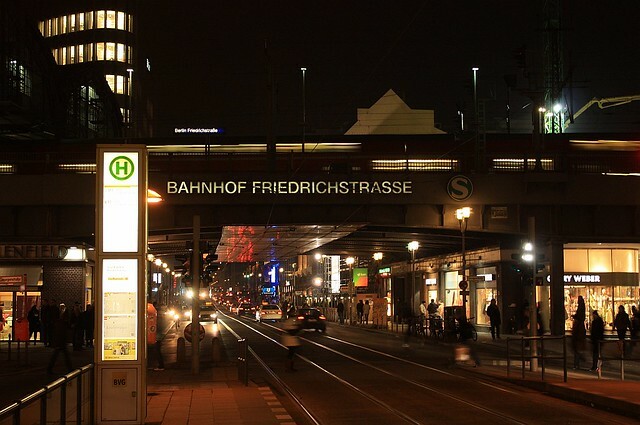 Trains provides vital connections along a “central” west-east axis with trains west to the Hauptbahnhof, Charlottenburg, Westkreuz, and beyond; and east to Alexanderplatz, Ostbahnhof, Ostkreuz, and beyond. Trains along the north-south axis provide intracity and intercity connections, respectively, in Berlin and the metropolitan region. Regional Deutsche Bahn trains stopping here at Friedrichstrasse also provide connections to other cities and towns in the surrounding state of Brandenburg. North along Friedrichstrasse (north of Dorotheenstrasse), Berlin Mitte. 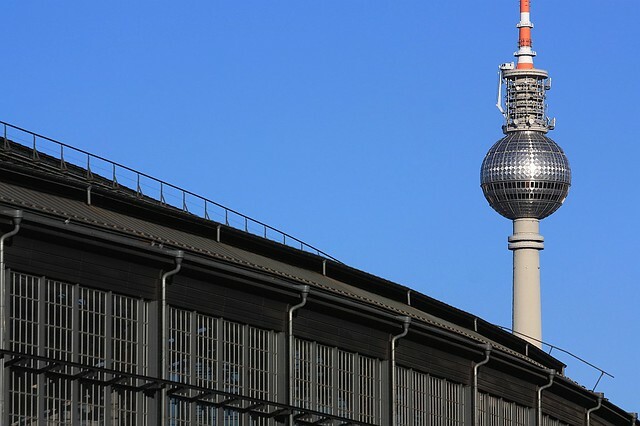 Fernsehturm looms over Bahnhof Friedrichstrasse: Dorothea-Schlegel-Platz, Berlin Mitte. “Züge ins Leben, Züge in den Tod” at Dorothea-Schlegel-Platz, Berlin Mitte. 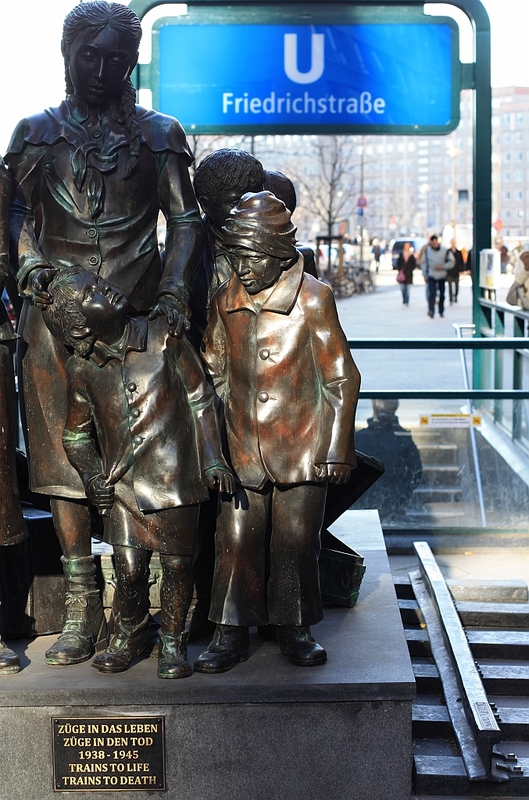 Just outside the station at Dorothea-Schlegel-Platz stands a memorial statue, “Züge ins Leben, Züge in den Tod” (“Trains to Life, Trains to Death”) by Frank Meisler. Two groups of children are shown : at the outbreak of World War 2, one group of children flee safely to England on the Kindertransport trains, whereas the other group of children are transported by train in deportation to concentration camps. With the Kindertransport, the lives of about ten thousand children are saved. Similar memorial statues are found in Liverpool, England and Gdańsk (Danzig), Poland. I made the photos above about a year apart on 10 March 2010 and 19 March 2011. This post appears on Fotoeins Fotopress on fotoeins.com as http://wp.me/p1BIdT-OW. 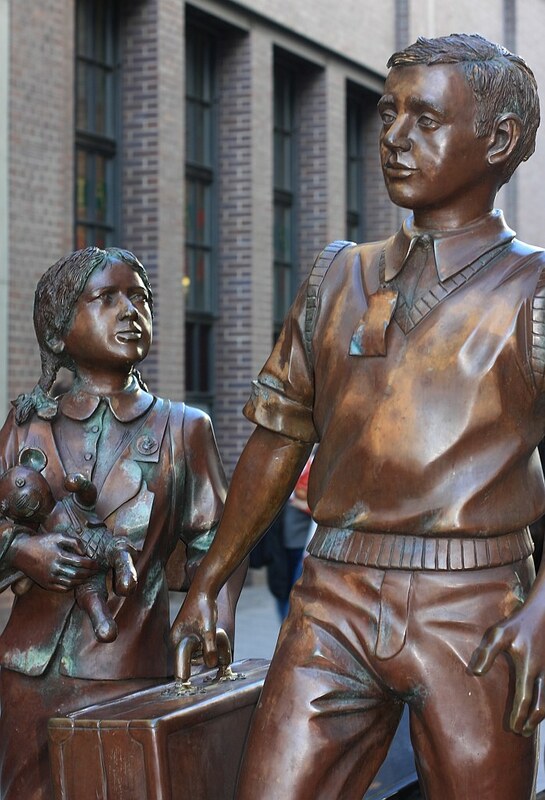 The statues in particular are very powerful; I didn’t realize so many children had been saved by the Kindertransport. Thanks for the post.